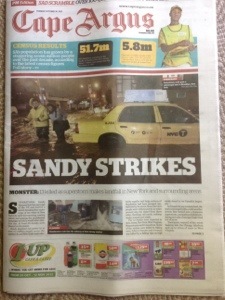 I am used to being home on the East Coast, reading about and following calamities here in Southern Africa. It feels very strange to be in sunny Cape Town obsessively monitoring the path and impact of Frankenstorm Sandy. I am relieved that family and friends are safe, but horrified to learn of all the destruction.